Over the last year or so, I have found myself dabbling in the world of wallpaper, specifically the removable kind. And nowadays, so many amazing brands are making beautiful, high-quality removable wallpaper and decals! Its like candy for the style addict! Let's take a look at a few wallpapered areas of my home and see what all the fuss is about! That retro sunburst print in the entryway perfectly blended with the gray walls and gave just enough pattern and color to make the little space feel happy and finished. It was fairly easy to install but a bit tedious and time-consuming lining up each panel. My advice would be to order extra and take your time! It's incredibly easy to remove and reposition though, making it the perfect item for the fickle stylist and home decor enthusiast (me). It's from Chasing Paper and one of many amazing designs they offer. There are so many fun styles out there but in my experience, I have found that sticking to designs that aren't too bold and in your face fits my aesthetic a bit more. You still get the impact, but a softer and quieter version that blends without demanding all the attention. 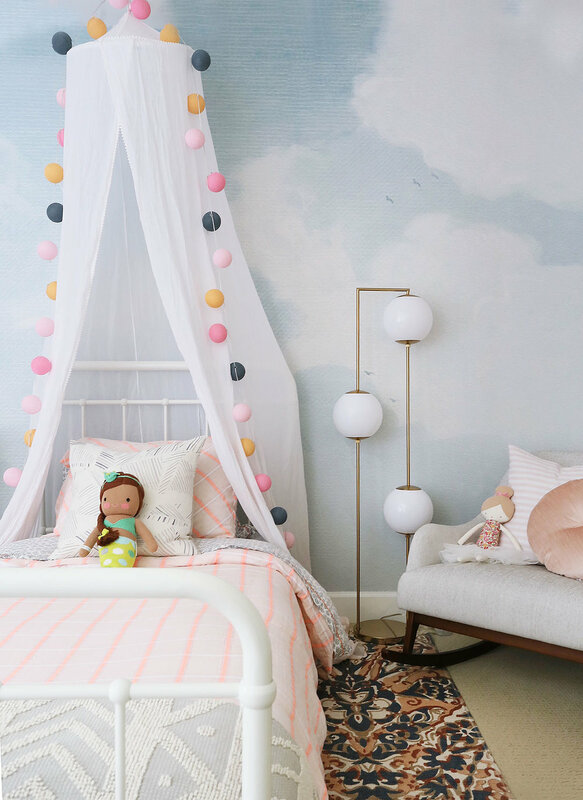 That Anewall cloud mural was the perfect solution for an accent wall in my daughter's big girl room. Its so light and dreamy and really makes the room without demanding all the attention, which sounds a bit like a contradiction but it works! Technically it's a traditional paper, but they make a removable version in that design. I always get so many questions on the 'dot wall' in our bonus room and folks are always surprised (and delighted) to find out those dots are actually decals. It was ridiculously easy to install (and I use that word very lightly) but I made the mistake of not ordering enough (twice)! All in all, I would use those decals again in a heart beat though! You can remove them in a flash and - boy oh boy talk about a graphic impact! I guess I do like a bold choice in the right place! I'm obsessed with that chalkboard wallpaper from Rachel's home tour. What a fun and creative way to use removable wallpaper with kids in mind. I love that it functions as part decor and part canvas for her kids to create to their hearts desire.